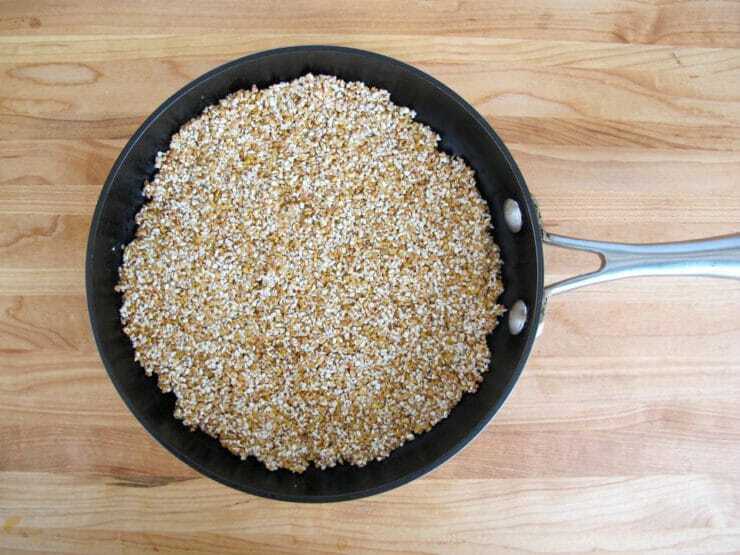 Kasha, an earthy and fiber-filled grain, is one of the oldest known food staples in Eastern European cuisine. 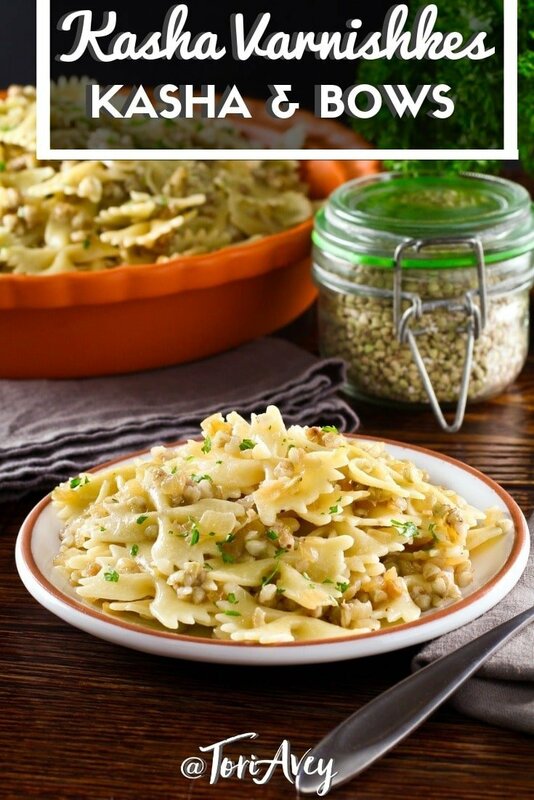 Also known as buckwheat groats, kasha is popular with descendants of Ashkenazi and Yiddish-speaking Jews from Eastern Europe and Russia. 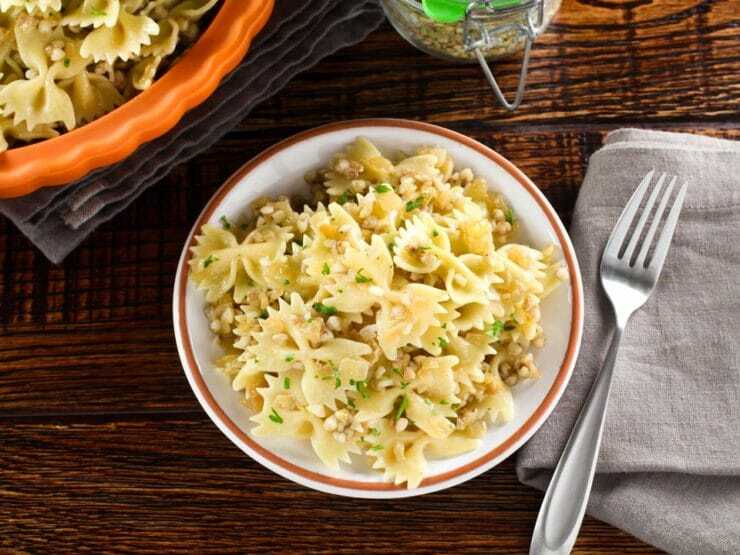 In this preparation known as Kasha Varnishkes, toasted kasha is tossed with egg noodles, fat, salt and pepper to create a warm, comforting meal. 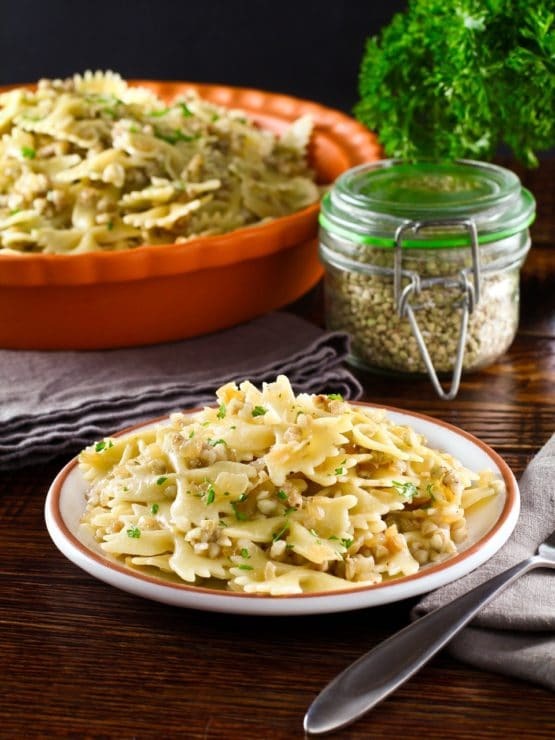 In America, the most popular noodle choice for this dish is bowtie pasta, leading to the recipe’s American nickname– Kasha and Bows. When cooking Ashkenazi Jewish cuisine, we might be tempted to steer clear of unhealthy traditional ingredients like schmaltz (rendered chicken fat). And yet, nothing can compare to the way that schmaltz enhances a dish like Kasha Varnishkes. Substitutes pale in comparison to the real deal. When faced with the decision to make a dish either healthy or authentic, for me authentic wins hands down. 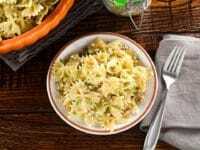 Dishes like Kasha Varnishkes are a “treat” and should be enjoyed that way. If that means coating my pasta and kasha in melty, savory schmaltz, so be it. 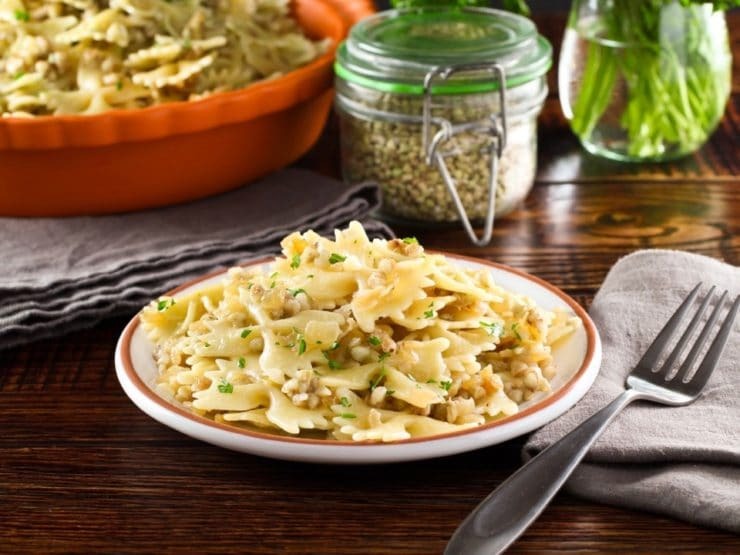 Learn to make Jewish kasha varnishkes the way bubbe did - bow tie pasta, toasted kasha, caramelized onions and melty golden schmaltz. Kosher. Nutrition Facts calculated using schmaltz (chicken fat) as the oil of choice. Preheat oven to 325 degrees F. In a small bowl, mix together kasha, beaten egg, ¼ tsp of salt and a dash of black pepper. Stir with a fork until the kasha is well coated. 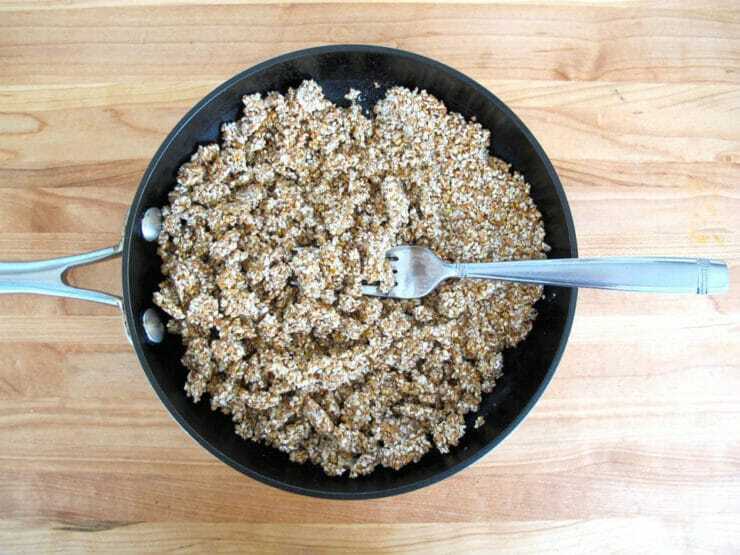 Spread mixture into a small oven-safe nonstick skillet in an even layer. Place in the oven and let the mixture cook for 15-20 minutes until it's dried all the way through. This will “toast” the kasha. 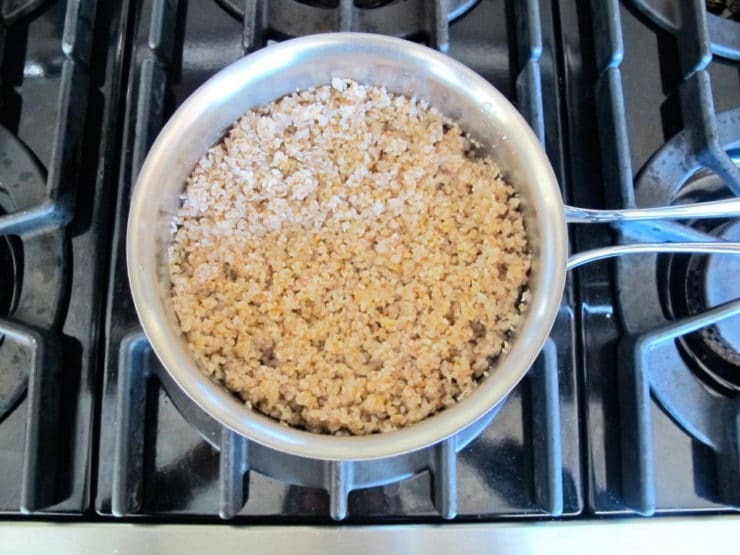 As the kasha is toasting, heat 2 tbsp schmaltz, butter, or olive oil in a large skillet or sauté pan over medium. Fry the diced onions for 15-20 minutes, stirring often, until they are very tender and caramelized golden brown. Reserve both the onions and the oil. Meanwhile, boil 3 cups of water and ¼ tsp of salt in a medium saucepan for the kasha. 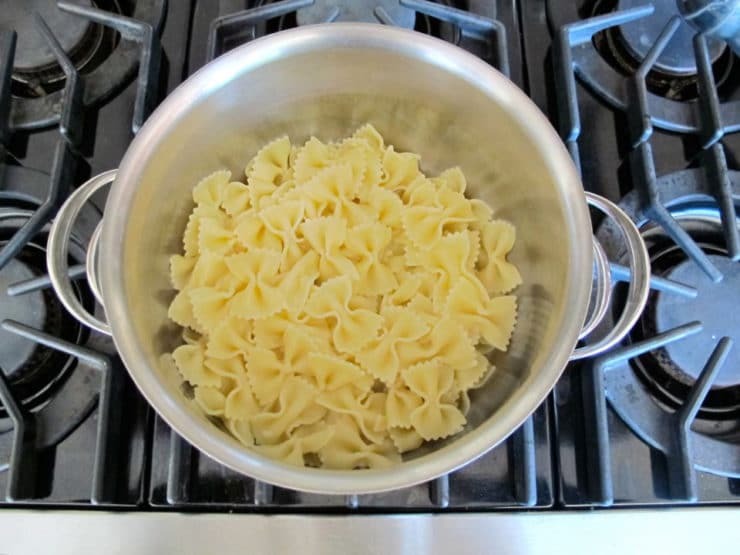 In a separate pot, boil about 8 cups of salted water—this is for your bowtie pasta. 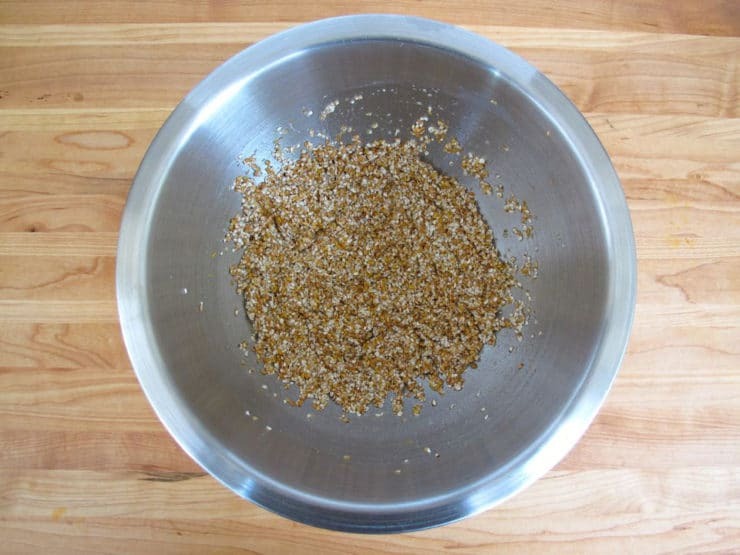 Remove the kasha from the oven and break it apart completely with a fork, separating all the chunks into small pieces. Pour the kasha into the medium saucepan with 3 cups of boiling water and stir. Cover the pot, reduce heat, and simmer for about 15 minutes. Check periodically to make sure the kasha isn't becoming overly dry or burning. When the kasha is nice and fluffy and the water is fully absorbed, after about 15 minutes of cooking, remove from heat and fluff with a fork. Break apart any clumps that may have formed. Pour the cooked kasha and the sautéed onions with oil over the pasta. Add the remaining 3 tbsp of schmaltz, butter, or oil to the pasta. Mix all ingredients together until well combined. Add more schmaltz, butter, or oil, if desired, to moisten the pasta. Season generously with salt and pepper. Serve hot. Garnish with chopped fresh parsley, if desired. I made this last night to go with our salmon and my husband and I loved it! My husband had never had kasha and he had no clue what to expect. This was my first time making it myself after seeing my mom and grandparents and aunts and uncles make it numerous times growing up. I did use schmaltz and I think the recipe was easy to follow and very clear. Yes, it can be a little time consuming with a lot of steps, but I know next time I make this it will go much faster. I used my food processor to chop the onion which I am so glad I did because it saved me a ton of chopping time. I also used Hanukkah shapes pasta instead of bowties. Thanks, Tori! Glad you liked it Lacey! In my experience, it’s not necessary to simmer the kasha. All you have to do is put the kasha in heat proof container and add water. I use a glass measuring cup. The amount of water is not crucial, but needs to be at least twice the volume of the kasha. I usually err on the plus side, because the excess can be drained afterwords. Place in a a microwave oven and set the timer to boil the water, then allow it to cool for 2-3 minutes. Pour into a colander or sieve. and it’s ready to use. The heating and cooling can be done in the microwave while you saute the onions and boil the noodles.. This really streamlines the whole process, because the soaking, boiling, and sauteing can be done simultaneously. Tori, I love this method of toasting the kasha. I had always done it in a fry pan/cast iron skillet, but this is preferable for evenness and less “work.” Thank you for this delicious recipe! It tastes just like my grandmother’s and my mother’s! Kasha varnishkes is probably my most favorite childhood food and I make it often. Your recipe is nearly identical to my Bubbe’s, with the exception of roasting the kasha in the oven. She always did it in the skillet. It makes me happy to see that our culinary heritage is not only preserved but also celebrated. i’ve always “dry cooked” the kasha in a cast iron pan or in a regular pot. this way i can watch it more closely than by putting it into the oven. That works too! As long as you keep it on a low even heat. Cooking it too fast can scramble the eggs. I love this dish and used to make it frequently when my children were small. As I remember I carmalized onions and mushrooms and mixed them in. Also, I use much more kasha than pasta. Thanks for the reminder and I will get some kasha again. Hi there! If making the day before, how can I reheat? Hi Sunny! Pasta like this is always best served fresh, but if you need to make ahead you can reheat it on the stovetop or in the microwave. I would suggest adding a bit of water to the pan or dish you’re reheating in to help refresh the pasta and keep it from sticking together/clumping. Stir well (but gently) after reheating to break up any clumps of pasta. Good luck! I’m making this for Rosh Hashana. I need to increase the recipe to feed at least a dozen people. Any tricks that I should know about? I am wanting to introduce my kids to this meal. But I have a question. Or brown, ready toasted buckwheat. Do I need to retoast the ready toasted buckwheat, or is that only for the green buckwheat? I am looking forward to your answer! Hi Dia! You should only use toasted buckwheat for kasha varnishkes (not green), and yes I do recommend the additional stovetop toasting step to add more flavor and a light texture. Just like my bubbe made, it tasted like home! Thanks for the recipe! An interesting sidelight of whole process, which I observed when my mother would take me along with her to shop for food., was the interesting manner in which she purchased a chicken, way back in the early to mid 1950’s. Within walking distance of our house was a kosher poultry market. In the market , and outside in the back, were crates of live chickens. The owner, a bearded “shoichet”, a ritual slaughterer, would pick out a chicken and weigh it on a specialized scale with a spring like device to hold and keep the poor bird on the scale’s platform. After my mom ok’d the purchase, he would proceed to say a prayer and immediately slice its neck an hang it upside down to allow its blood to drain and kill it. Supposedly this is humane and painless way to die. I’m not so sure about that now. Afterwords, slaughtered fowl would be brought to the back of the room where there were women who removed the feathers. The Yiddish word for this is “flikken”, פליקענ That this rhymes with “chicken” I guess is just a somewhat macabre coincidence. At any rate, the final preparatory step would be to pass the chicken a large gas burner yo burn away any last remaining bits of feather, and wrap it in news paper. Most of this was usually done while we went to a green grocer, a kosher botcher shop, a Jewish bakery, and/or a supermarket. On the way home, we would revisit the poultry market, where my mom would pay for her purchase and hand the still warm package for me to carry on our way home . The bird was usually our dinner that very same evening. These experiences are unusual by today’standards. I guess I don’t get grossed out because I associate the memories with my om at a very innocent time of my life. Still, that I eat very little any type of animal flesh today may not be a coincidence. Thank you for your story! My family is from Odessa, once home to a massive Jewish diaspora, so a lot of culture kinda seeped everywhere. My parents used to cook with schmaltz, we called it “smaletz”. You know, recent research is actually showing that fat in general, and even animal fat is not as bad as previously thought, and in many cases is better than vegetable oils. Buckwheat is actually a fruit seed and not a cereal grain, as you wrote. Sorry I had to nerd out on you on this largely irrelevant point. My memories are so similar! Mrs. Plotnick, from the butcher shop, would walk across the wood shavings covered floor, go to the gas jet at the far corner of the shop, and open up a box of wooden matches. She’d turn on the gas and light the flame, then slowly turn the chicken over the flame to burn off the pin feathers. How I remember that smell! Thanks for sharing your story and great memories. My mother would stir the fat from the chicken and onion before Shabbos dinner. I used to love eating “gribnes”! I Elaine, I love your description of the process of butchering the chicken! My grandfather was a kosher butcher, from Russia, and I remember those chickens coming home, and my grandmother doing the “flicken!” I haven’t heard that word since I was a child-I think I was about 5 or so, watching my Baba with great interest do this!! Hi Julie, Tori’s assistant Ashley here! Unfortunately I’m not sure where you can find canned kasha. I would try your local kosher market and if they don’t carry it they may know where it can be found. You can buy toasted buckwheat in many European, Polish, Ukrainian or Russian groceries or supermarkets, or occasionally in European/International section of regular supermarket. In russian store. It is called grechka. 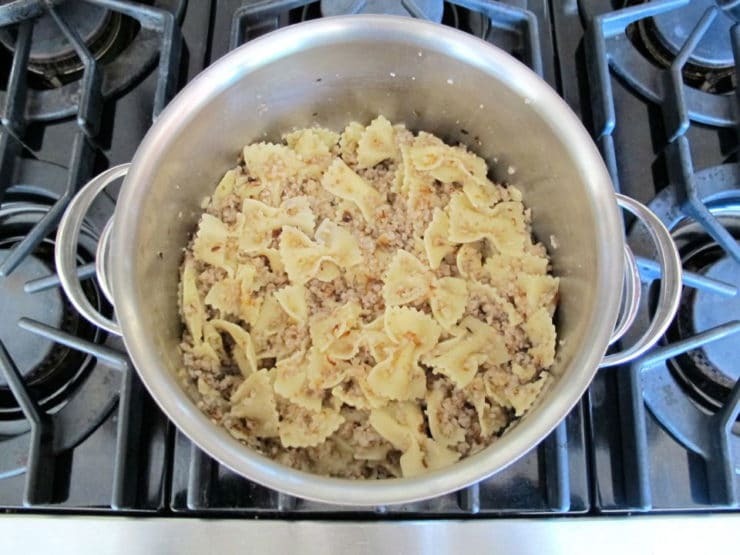 Can cooked Kasha varnishkes be frozen? Hi Bea, Tori’s assistant Ashley here! I would not recommend freezing this recipe, as I don’t think it would thaw well. My father loved kasha varnishkes, and I made it for him many years ago. I add sliced crimini mushrooms to mine with the sauteed onions. The addition is an added delight to the taste buds as well as a nutritional benefit. My friend taught me this recipe; she used vegetable broth, and added mushrooms to the sauteed onions. I’m not vegetarian, and I don’t know from kosher, but I use beef broth to cook the toasted kasha. And those Barilla mini bowties….? WONDERFUL!!! 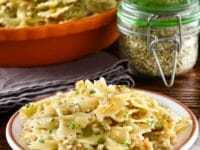 My wife’s Italian and she she absolutely loves all the Jewish dishes I cook for her, especially kasha varnishkes. Sometimes I even use an Italian broad egg noodle called pappardelle. I also use these to prepare my mother’s lukshen (noodle) kugel. Talk about fusion cooking!! You can find schmaltz in the kosher frozen section of your supermarket…mine is Publix. It comes in a 7 oz container put out by Empire Kosher. Ty I was trying to figure out where to find it. There are no real words to articulate how much I appreciate you, your ideas and your wonderful recipes! Thank you, thank you, thank you. I have been making kasha varnishes my whole life. My physical disabilities from a car accident (not my fault) has worsened considerably and I can no longer stand or wal. Your idea to toast the kasha in the oven saves me from having to stand by the stove toasting it!! Wow!! You saved me!! Shana Tova. All the best ! Sweet Darlene, bless you! Shana tova, have a wonderful holiday! Hi Bella! Do you mean in the kasha varnishkes or alongside them? Pretty much any veggie would work alongside– I’m thinking steamed young green beans might be nice, or broccoli, or a spinach salad. If you’re talking about cooking veggies in the dish, that’s a different story… I’ve never mixed in vegetables before. Yes, kasha varnishkas are certainly comfort food. Each family has their own special twist, just like with brisket. My mom made it with schmaltz and on the stove. 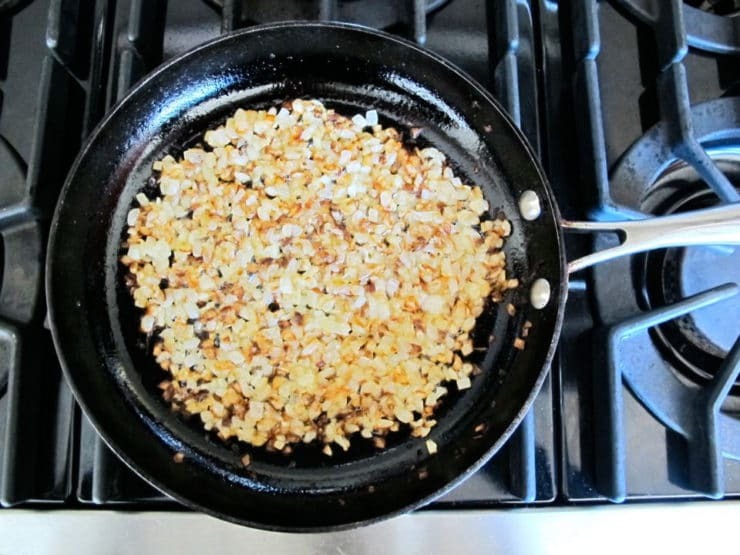 I use peanut oil to fry and carmalize the onions adding a wonderful layer of flavor. In addition I mix boullion cubes in the water when cooking the kasha. Always serve this with brisket..Like my mom did. Used to use Nyafat but haven’t seen it for years. Is there any substitution for Nyafat? In Florida Publix sells a five ounce can of rendered chicken fat that is made by empire kosher. It is found in the freezer with the other kosher products. That is the closest I gave found to home made schmaltz. It is good. My mom and bubbie also sauteed mushrooms with the onions. Naturally I do the same with shmaltz of course. A real comfort food. I also use chicken broth with the kasha. My Mom used oil for this dish. She did not cook with schmaltz much. I don’t get to eat kasha varnishkes often enough–hardly at all, thanks to my squeamish husband and picky son. So sad. Anyway, in my family we toast the egg-coated kasha in the saucepan, then add the boiling water. No need to turn on the oven! As far as “authenticity” goes, I think it’s completely a matter of what you grew up with. My mom’s kasha varnishes is authentic, to me. And that’s all that matters. Kasha Varnishkas was my childhood comfort food. My mother made it just the way you do. I’ve changed the recipe a little. Instead of using the egg for toasting the kasha I just put the kasha in a frying pan with a little bit of oil and toast it on the stove. Then I saute the onion with some broccoli in oil but add a tad of butter at the end for flavor. This way, for me, it’s a complete one pan meal. So love everything about your blog. How + what you take pictures of, your text , it’s humor, grace and style. I look forward to checking in to see what you are going to present. All the time knowing I’m going to love + enjoy what I find. Barilla offers MINI bow tie noodles. You will never go back to full-size bow tie noodles, again~~! I have eaten Kasha Varniskes my whole life! My mother never used schmaltz, I never use schmaltz, it is still delicious and “authentic.” Who’s to say what is authentic? It’s delicious either way! Made this tonight using Quinoa/Corn GF pasta, it was amazing. Brought back memories of when my Bubba made this for dinners. Thanks so much. This was my fathers favorite comfort food from his Mom,my grandmother.thank you for that great memory! We’d skin a chicken, & render its fat with Walla Walla onions but more importantly I like what your cooking up! Shalom. Just like Grandma used to make! Of course you must use schmaltz … just isn’t the same without it! My family and I love ALL your recipes !!! I adore you! There is no substitute for schmaltz. Once a year I still spread it on matzoh for Passover. Love your blogs — Thanks for everything. We love you! It’s raining outside and this is the perfect recipe for today. Mmmmm reminds me of my Mom’s cooking!